This stripey roman shade in F. Schumacher Andy Stripe colour Sky adds a bit of softness to all of the hard surfaces in the room, and makes an eye catching statement. This stripe is definitely not nautical, and would look amazing in any kitchen, bathroom, office or bedroom window. Each roman shade comes with a loop chain mechanism like a blind, which can be secured with a hold down. It also comes with cotton lining, which will allow for subtle light filtration. We are always keen on safety first so please read our guidelines on child safety and shades here. 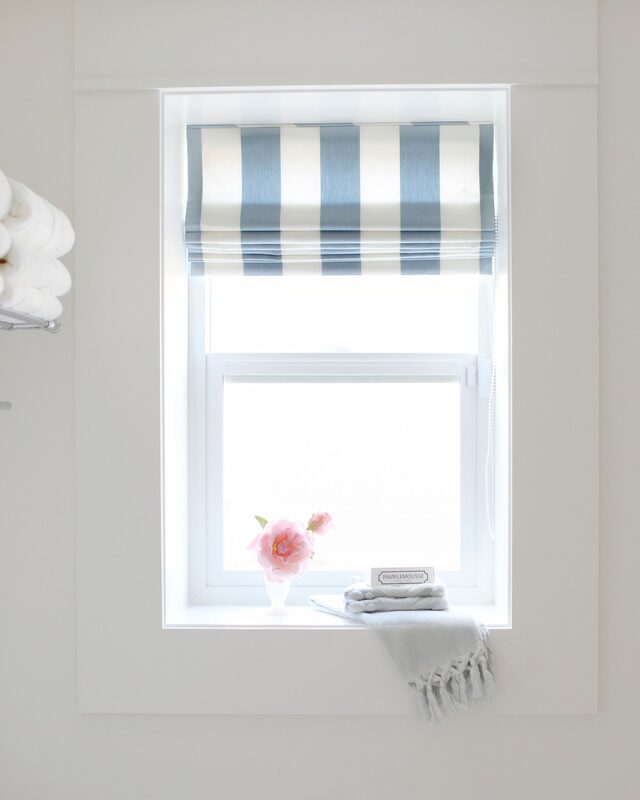 If you choose to outside mount your flat roman shade, add 2” to your trim to trim width. For inside mount please provide us with the tight measurement of the inside of the frame and we will deduct as necessary. Leave your exact sizing in the “Note From Buyer” at checkout and select the closest size to yours from the drop down list by rounding your size to the closest size offered. Our shade headrail hardware requires at least 1″ inside your casing to install the bracket and 2″ within the casing to be fully recessed. If you are inside mounting the shade with less than 2″ of space your shade will protrude out from the trim. In all cases, even with blackout lining, the shade will have light gaps on the side and bottom on both inside and outside mounts. Enter in your desired specifications and price will be calculated for you. This price for your shade includes your choice of Cotton Lining (standard), Blackout Lining (room darkening), and mounting hardware and each order is made just for you so if you have any special requirements don’t be afraid to reach out and we’ll be happy to help you get it just right. If you need a truly custom length please email us and we can modify your order accordingly!